Geezer, RezDog and JOB15 like this. Things look good, from the pics. They look pretty good but will need time on the stones to remove chips & establish a bevel . With old razors condition is everything. Those look to be in decent shape. Use tape when learning to hone and they will continue to look great. Very little spine wear, should clean up with just some oil, steel wool and good metal polish. Yup, will need a good honing, should be a couple of shavers. 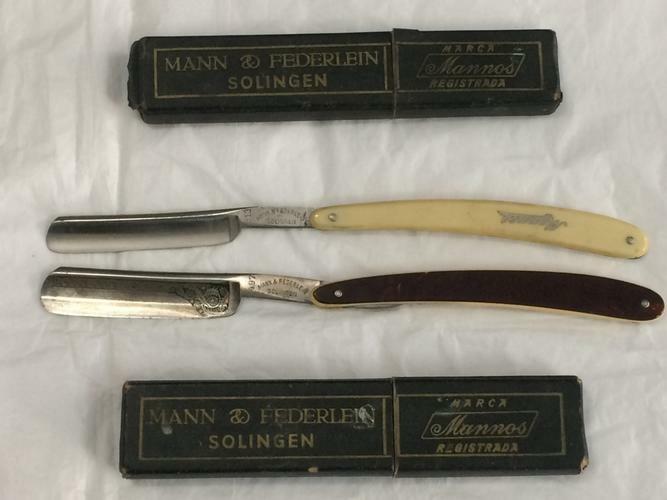 I do like thin old razors, I have several and are some of my favorite shavers. At $25 a piece, a great value for a couple of shavers. 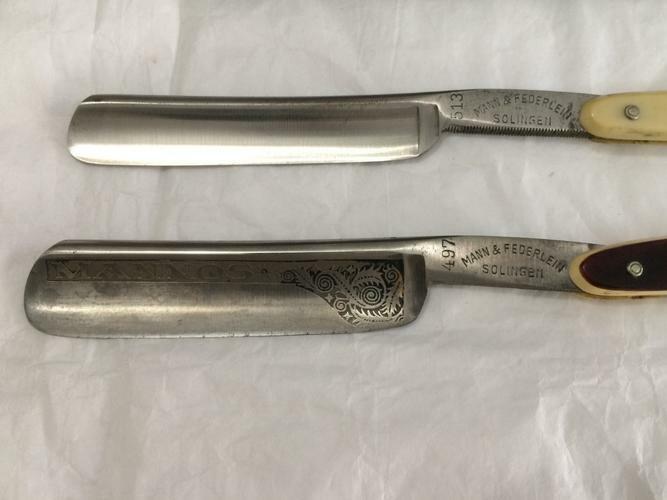 The brown one with two tone scales and blade etch, was probably a special razor. The white one looks to be pinned collarless, looks a bit thick, but Ivory? Collarless pinning is usually an indication of a quality razor. Yea, I’d snap them up. I like all the restoration and honing process, it's part of the charm I guess. Here is a close up pic, neither of them are pinned collarless. I don't have any hopes for the white one to be ivory, but I guess I can't know for sure unless I buy them how can I get the etched background to be black again after polishing it? Clean with fine 0000 steel wool and metal polish, then polish with the finest wet and dry paper you can find, at least 2k or lapping film is better. You can darken the etch with vinegar, or gun bluing and buff the excess with fine wet and dry or lapping film. Daily use, cleaning and stropping will remove it eventually. For my shavers I do not bother with darkening the etch and just keep clean. There are some good threads on Etch Darkening in the workshop forum.